Baby showers…sweet tiny outfits, delicious treats to eat and decorations decked out in pinks and blues and creamy shades of pastels. Showers are lovely, but can wreck havoc on your pocketbook. These tips will help create a memorable occasion that won’t break your budget. Accept help Maybe the mom-to-be is your best friend and you have always dreamed of hosting a baby shower for her. That’s great, but she’s probably got a few more friends and relatives who would love to help as co-hosts or contributors. Let them help – it will reduce your costs and make pulling off the event easier. DIY With sites like Pinterest and other social media, great, affordable DIY ideas are only a click away. You can glean decorating ideas from things you may already have around the house, or else inexpensive ways to make darling decorations. You may be surprised how easy it is to put decorations together that don’t cost much. Making food yourself (with help!) can save a ton rather than having it catered. Decorate with actual items You get two for one this one. For instance, instead of a banner you’ll just throw away, string a “clothesline” across a wall or room and hang newborn onesies on it. 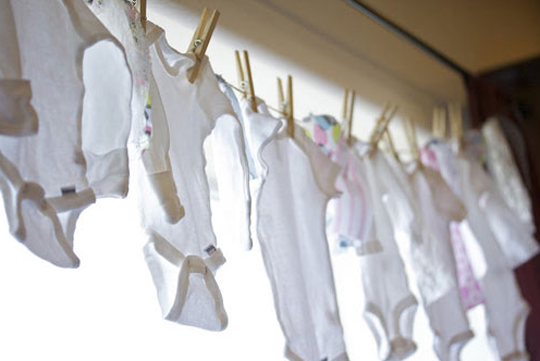 It looks adorable and the new parents can take the clothes home for the little one. Time it right It’s much less expensive to have light snacks than a real meal, so time your shower accordingly. If you have it at 10pm or 4pm offer a “tea” with some beverages and a few pretty sweet and savory snacks instead of lunch. Evite Send out Evites and you won’t be paying for custom invitations, or even off the rack stationary, which can add up – along with postage. Homemade sweets for favors Instead of purchasing a trinket for take home favours bake a batch of something sweet (or have one of those helper friends do it) and package with a pretty bow. Baby showers are a wonderful way to celebrate a new baby and friendship. The most important thing is to have fun and make it special! About the author: Heather Legg is an experienced baby shower hostess who writes on a variety of topics, including frugal living, social media, and disposable diapers.